Mark Your Calendar: 29th – 31st May 2015! AeroExpo UK will take place during 29 – 31 May 2015 once again at Sywell Aerodrome, which will also mark the 10th anniversary of the event. AeroExpo UK is THE Festival of Aviation to attend in the UK, showcasing the best in General Aviation over three days. Demo-fly the latest aircraft on the market and browse a wide range of related aviation products & services. 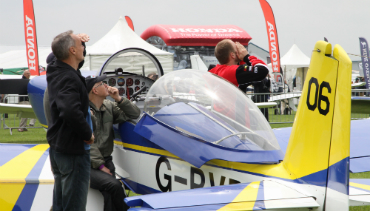 A thrilling air display, lifestyle area (featuring luxury cars, boats and leisure items), free seminar series, aviation fashion show and evening entertainment mean there really is something for everyone at AeroExpo UK. With around 170 Exhibitors exhibitors, 12,000 visitors and over 1,050 visiting aircraft, AeroExpo UK is a must attend for all!